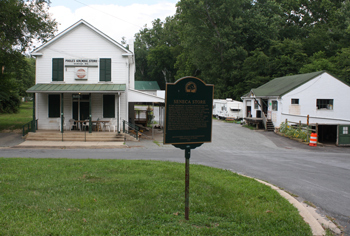 Originally called the "Seneca Store", the general store was built in 1901 by Frederick Augustus Allnutt. Allnutt had operated a store adjacent to the C&O Canal, but the location was too vulnerable to flooding from the Potomac. So in 1900 he purchased a house on higher ground, and built a larger store, along with a barn and springhouse. The business was sold in 1965 to Raymond Poole and his wife, who renamed the store as "Poole's General Store." The store was one of the few buildings in the area to survive the devastating flood from Tropical Storm Agnes in 1972. The store was acquired by the Montgomery County Department of Parks in November 1976. At the end of 2010, after more than 100 years of continuous operation, the Pooles closed the store, but some feed services are being provided by Farm and Home Services, Inc.
Montgomery County is working to find a long-term tenant who will continue the services at the site. The building is listed on the National Register of Historic Places as part of the Seneca Historic District.